The Itty Bitty Kitty Committee: See What We Did!! 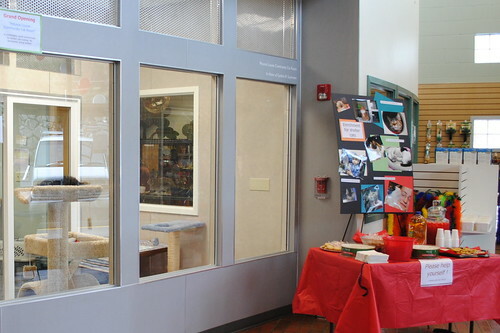 Last fall, with the funds that we raised during our 2011 FUNdraiser, the Humane Society was able to build The Petunia Louise Community Cat Room. It's a ten by eight foot glass-walled enclosure filled with climbing trees, privacy boxes, and lots of soft spaces to sleep. The room is bright, comfortable space, large enough to hold 6 - 7 cats. 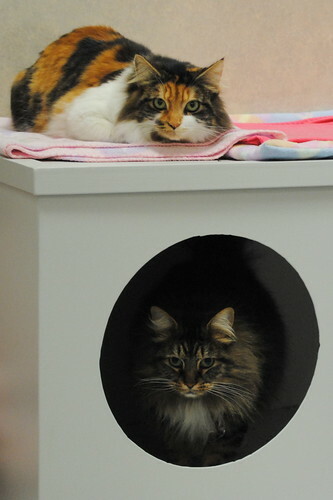 Often the seniors, bonded pairs, and the harder-to-adopt cats are placed here. The room allows them to relax and come out of their shells. 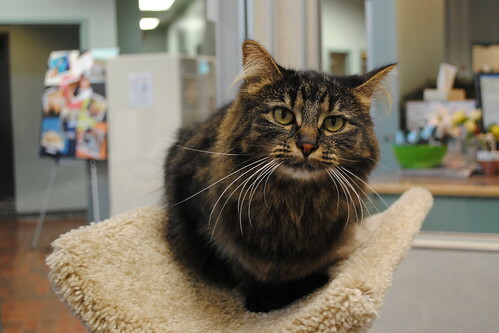 Better matches can be made when adopters are able to see cats showing their true personalities. Showcasing the cats in a more home-like setting is proving to be very attractive to the adopters, and the cats placed in this room always go fast! Look! We've made a difference! 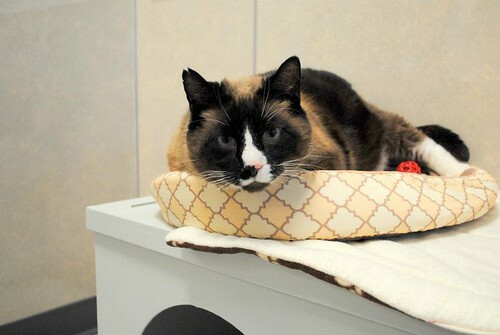 We pool our donations together, the Humane Society builds a dreamy room, and seniors, bonded pairs, and harder-to-place cats find their perfect, loving homes. Doesn't it make your heart happy knowing you were a part of it all? A big thanks to Marguerite at the HS for providing these pictures! So who's Petunia Louise? Her full story tomorrow. Wow those climbing places look awesome! So do the hidey holes! 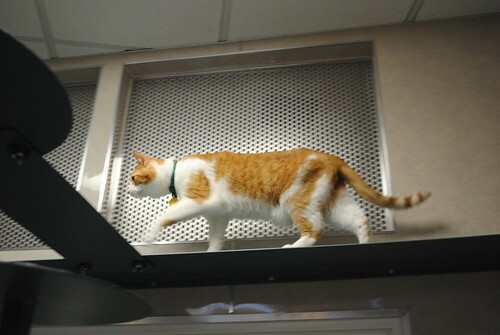 Are those current cats for adoption at the shelter? I think they've found homes - the pictures were take a few months ago. Thanks for the photos and for all of the work you do for the Humane Society, Laurie! I am proud to have contributed funds last year, and I've contributed three times this year (I can't say no to a matching challenge). Hurray for the collective power of the IBKC community! I really love that first cat pictured. The expression alone makes me melt--wish I lived nearby instead of on the other coast. Kudos to the HS and IBKC! and loud purrs to those who adopt seniors and special needs kitties. You...and Tacoma Humane Society do awesome work! Thank you for these pix. The kitties look very relaxed. Hooray for seniors! Hooray for the IBKC family! Lovely, just lovely. I think of how happy and grateful all the cats are in looking for their furr-ever home. 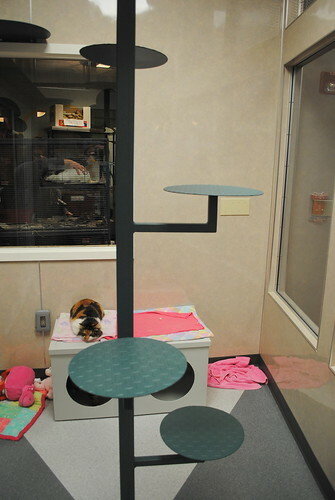 Who is the Petunia Louise Community Cat Room named for? I'm guessing somebody's beloved kitty cat! There's a whole post on her today. Thank you for posting the pictures, it makes me feel warm and fuzzy to think of the cats that are going to find their forever homes more easily because of the incredibly generous people who visit this blog - and because of the amazing work that Lauri, Craig and Miss Charlene do. I got to spend some time in the Petunia Louise room today (I volunteer at the Tacoma HS thanks to Laurie and Shana!). What a lovely space for kitties. To think that the room was made possible by the IBKC and Laurie, Craig and Miss Charlene. money going to good use!! I've only been to one humane society center and this one beats them 100x over. I love how clean and modern everything looks with the giant window. What a fantastic room and super duper cause. Thank you for the amazing work you do! I'll be donating later today! WHAT AN AMAZING ACCOMPLISHMENT!!!!!! it must feel so satisfying to see this!